Finely crush the allspice berries with a mortar and pestle, or grind them in a spice grinder. In a small bowl, combine the allspice with the peppers, garlic, onions, orange juice, orange zest, oil, salt and pepper. Stir to mix well. Preheat the grill. Put fish fillets in a shallow dish and lightly spoon the marinade mixture over them. Turn the fillets so they are evenly coated with the marinade and set aside for 10 to 15 minutes. Put the fish fillets on the hot grill, with the orange slices alongside. Cook until the fish 3 to 4 minutes per side. Turn the orange slices occasionally, so they brown evenly. 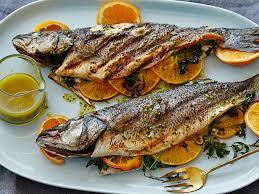 Serve the grilled fish with grilled orange slices.